Iconic New York Rocker, Johnny Thunders of the New York Dolls and The Heartbreakers. If you lived in NYC anytime from the 70's to the 90's, Johnny was King of the Lower East Side Streets. His attitude, NYC sense of humor, thunderous guitar playing, and sensitive song writing defined the era. A messy hero to many, and a cautionary tale to anyone who thinks they want to be a rock star. No matter what anyone says, he'll always be our Johnny! This is a one-off framed version. 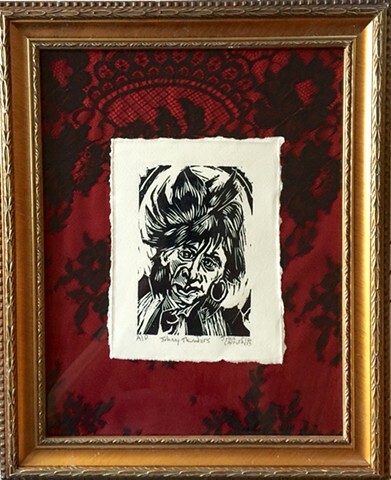 It's backed by red satin and black lace in a gold frame, as befits the one and only Johnny Genzale from Queens, NYC!